The filling is too hard to form a ball. - is it cold? If so, warm up the filling just enough to be workable. Be careful not to burn the sugar. If you start with dark brown palm sugar, your filling will be darker than mine. 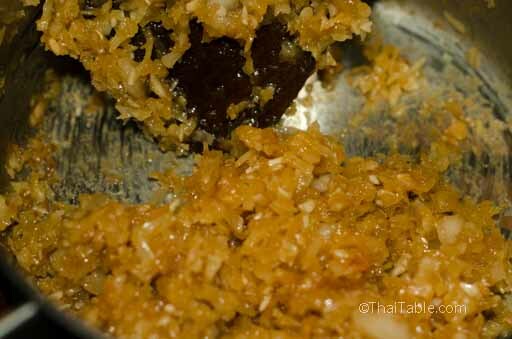 My palm sugar is relatively new, from my recent trip to Thailand. 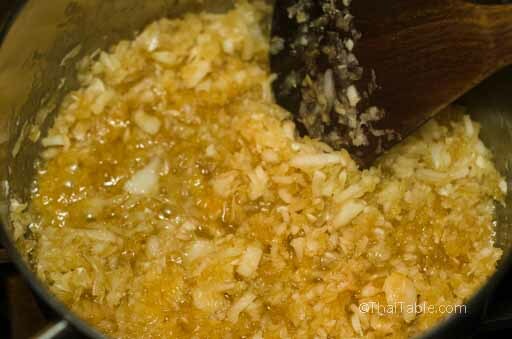 Thick and chunky sauce - adding more water and whisk vigorously. You may need to heat up the sauce briefly. If you have jasmine essence, add a couple of drops into the sauce. Traditionally, the filling balls are infused in the fragrance essence candle overnight. 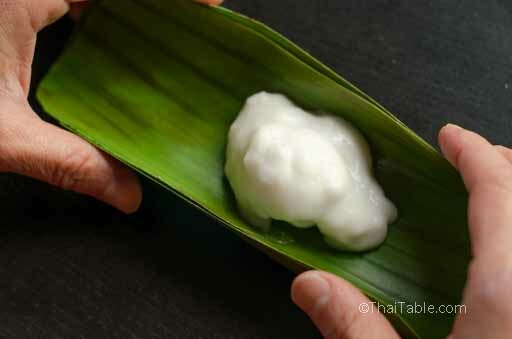 If you choose a banana leaf as a container, it's normal to see some spilled sauce after steaming. A thick sauce will result in a well formed dessert (which looks great) but misses the right consistency. There are 3 parts to this dessert: filling, wrapper, and sauce. It may sound complicated and discouraging but it’s only 3 steps involving 2-3 simple ingredients. 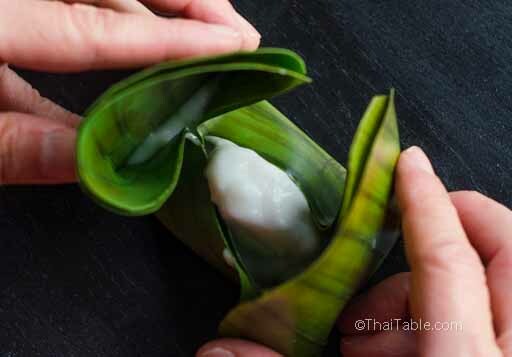 Traditionally, the dessert is wrapped in banana leaf as shown in the picture but, many modern chefs make them conveniently in small cups; removing the difficulty of finding and forming the banana leaf. I’ll provide both methods of packing. You can find grated coconut in the frozen section of most Asian markets. It usually comes in a white foam tray. When I made this recipe, I opted for frozen Trader Joe’s coconut; it comes in square chunks. I grated the coconut pieces using the food processor. In retrospect, it would have been better grinding them in my Blendtech blender, the size of the grated coconut was too coarse. 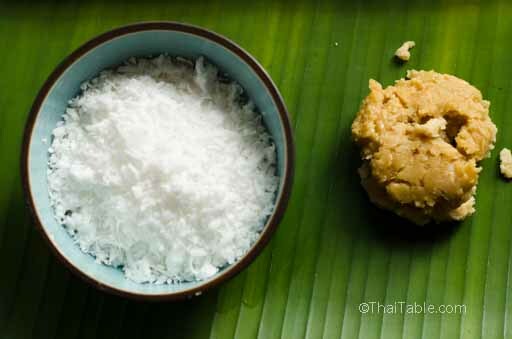 In a pot, over medium to low heat, add the palm sugar and shredded coconut. If the coconut is frozen, no need to thaw it. Stir to break up the sugar and mix it into the coconut. 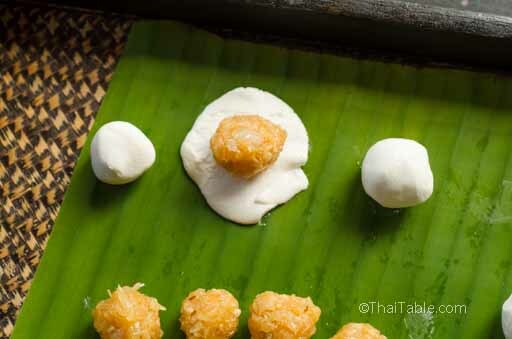 The sugar should start to bubble and seep into the white coconut flesh and turn it light brown (picture 2). Stir for 7-8 minutes until the mixture looks dry (picture 3). Turn off the heat, let the filling cool and move on to making the wrapper. The filling should be sweet but not overly sweet. 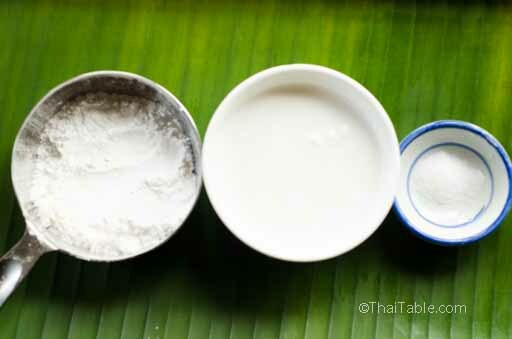 Mix sticky rice flour with warm water and knead. Warm water will make the dough pliable and smooth. Notice that the rice flour dough doesn’t stick to your hands like wheat dough. Set it aside. Move on to making the sauce now. Add the rice flour, coconut milk and salt to a pot. Stir to mix the liquid into the flour. When the mixture is well mixed, turn the heat on to medium-high. Make sure to stir to scrape the bottom of the pot where flour is thickened by the heat. Continue to stir until the mixture bubbles. It should have a consistency of thick sauce (picture 7). 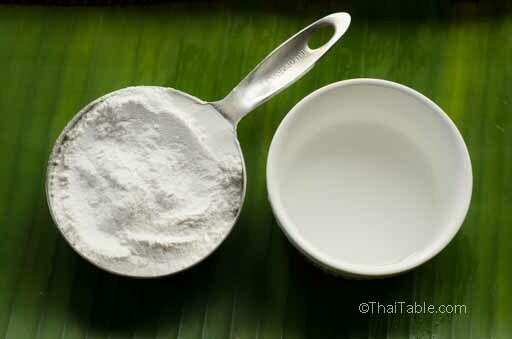 There should be no lumps if the flour is well mixed with the coconut milk before the heat is on. When the sauce is cooled, it will be thicker and harder to stir. If it seems too thick, add a tablespoon of water and stir vigorously to keep it smooth. Turn off the heat. This step should take about 5 minutes depending on your stove. It should be smooth and almost runny and taste like it has a hint of salt. Set the sauce aside. 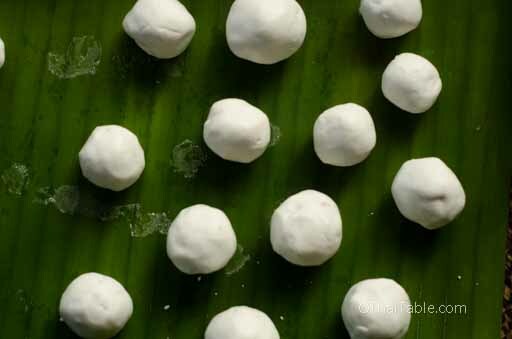 Making the sweet filling balls: While the sweet coconut mixture is still warm (warm to touch), form a ball about ¾ of an inch in diameter, with your fingertips (picture 8). The ball is easily shaped because of the sugar. The balls can be smaller or larger depending on the size of your container. Pinch the dough the same size as your filling, flatten it with your fingers and wrap it around the ball. Roll the ball between your palms to get a smooth coated ball. It should be easy to shape the ball. Heat a steamer on a high heat. 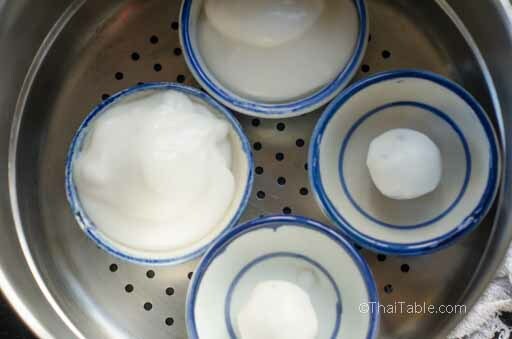 I use small Thai dessert bowls that are known for another dessert, kanom tuay. Heat up a steamer on high heat. Place a small amount of sauce into a container and add about a tablespoon of sauce on top. In picture 9, you can see the filling in the bowl before adding the sauce on top. You may need more sauce depending on your container. The sauce should cover the ball and appear smooth. If the sauce looks too thick add a tablespoon of water and stir vigorously. Steam the dessert for 10 minutes. Remove it from the steamer right away to stop the cooking. Kanom Sai Sai will dry and crack when overcooked. Banana leaves are available fresh and frozen at many Hispanic and Asian grocers. 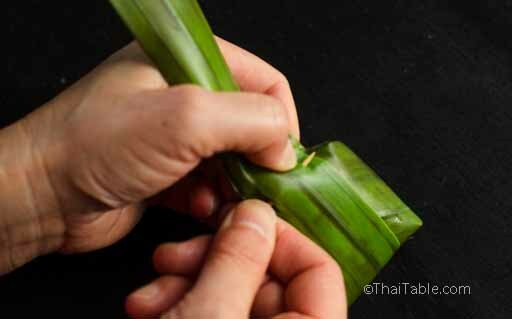 Cut the banana leaf into rectangular with round out edges (picture 10). 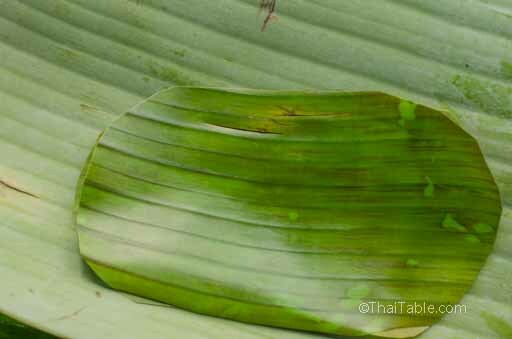 Usually, banana leaves are very dirty, so wipe them with a damp cloth. Make the leaf pliable by running it over an open flame for a few seconds; you can see the color changes to darker green when it’s ready. You can also blanch the leaf to get the same effect. You always put 2 leaves together with one perpendicular to the other for strength whenever you make a leaf container, so put the underside of the leaves together (the whitish side). The top is where you put the food on. 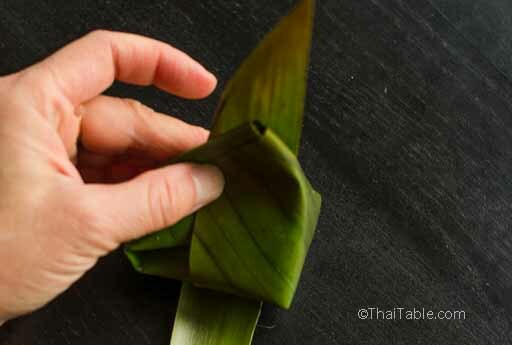 Make the handle with another piece of banana leaf, cut a thin strip about 1 inch by 14 inches. Run the strip over the flame as well. Break a toothpick into half for a fastener. Place one filling ball in the center, add the sauce on top, about 1 tablespoon. Fold the edges up lengthwise (picture 11). Pick up one end and fold into the center as the picture 12. Fold the other edge the same way, the tips should meet in the middle and for a tall packet (picture 13). This is the toughest part because the sauce can leak out and make a mess, but a few practices, you’ll be a pro. Once when you have the packet together, lay the strip in the center and pin it all together with a toothpick (picture 15). Steam for 10 minutes and remove promptly to prevent overcooking. Now for the best part: enjoy while it’s hot or have it at room temperature. Kanom Sai Sai can keep in the fridge for a few days too.